The Durban University of Technology (DUT) will host the Direct Current Technology: Renewable Energy Education and Skill Development in South Africa (DCT: REES) Project Seminar at Coastlands Umhlanga from 12 to 15 February 2019. Direct Current-technologies are rapidly gaining attention worldwide because of its efficiency and potential for sustainable solutions. In order to supply the country and its industry with adequately trained professionals in the ﬁeld of electrical and electronics engineering, this project also aims to develop and implement a new educational programme, with new courses and materials on DC-technologies for South African universities (Electrical and Electronics Engineering. The objective of the DCT: REES project seminar is to forge local and international collaborations between many universities, with industry, NGO’s, gov­ernments and look at collaborations into new courses, labs and projects for educa­tional institutions, based on state of the art research and industrial development. Other outcomes hoped for is to form modern DC-lab-inventory at South African universities, internships, projects and so-called Real Life Proof of Concepts which will research, demonstrate and promote the use of new DC-technologies in various conditions. This project is funded by the Erasmus Programme (EU). The Erasmus Programme is a European Union funding programme, originally established for exchanging students, but since 2014 extended with Erasmus+ to also support education, training, youth and sports in international context. After extensive project preparations of the 14 universities and partners involved in the DCT REES Project, a funding of 1.000.000 euros has been granted by the EU for a three-year plan of work packages, including strict financial and quality control. 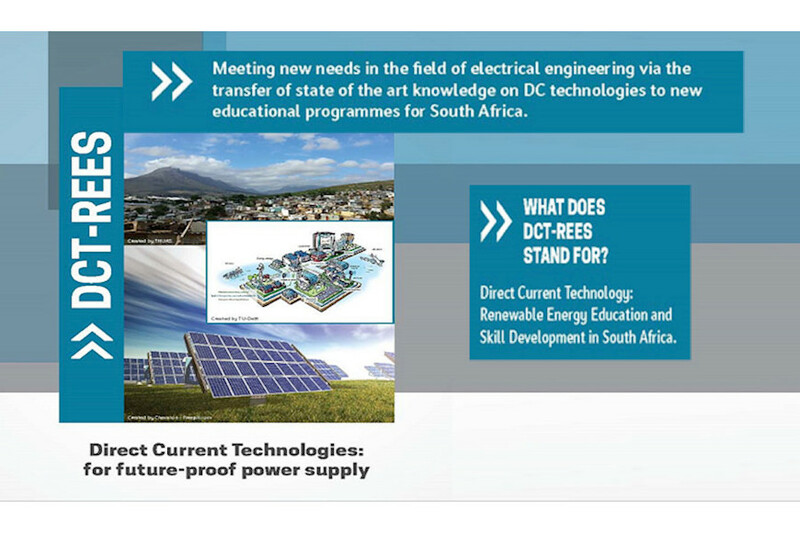 The DCT: REES Project Seminar, along with local and international partners, are hoping to look at innovative ways of meeting new needs in the field of electrical engineering via the transfer of state of the art knowledge on DC technologies to new educational programmes for South Africa. Presentations on DC protection principals and the relevance of the DCT-REES project will be examined and discussed with a wrap-up of outcomes, and the way forward on the final day of the seminar.